During a one week swing through Switzerland two years ago, I took a bus from Interlaken to a train, to a tram which rose to an elevation of 10,000 feet amongst the jagged mountain peaks of the Swiss Alps. My destination? A rotating restaurant on Schilthorn peak, which was built for the James Bond movie “Her Majesty's Secret Service.” It was there that I enjoyed my one and only lunch atop the Swiss Alps. 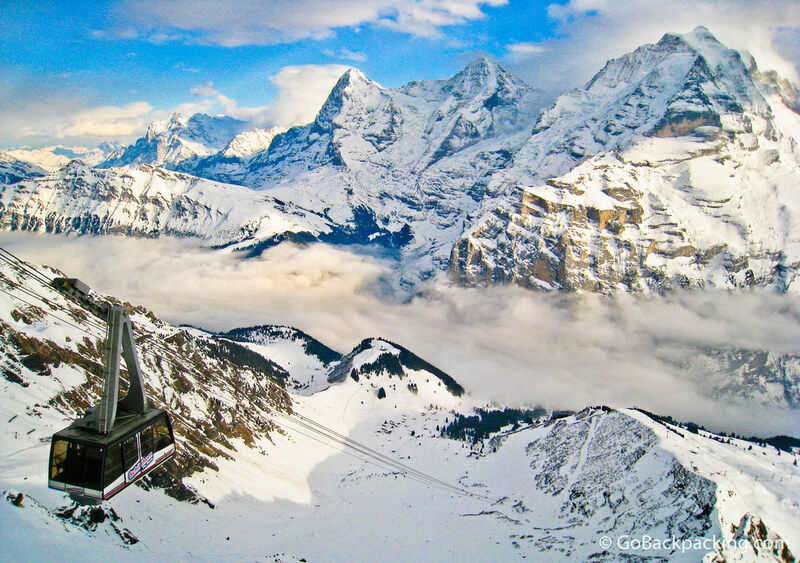 View of (from right to left): Jungfrau (4,158m), Monch (4,099m), and Eiger (3,970m) mountains from atop Schilthorn. 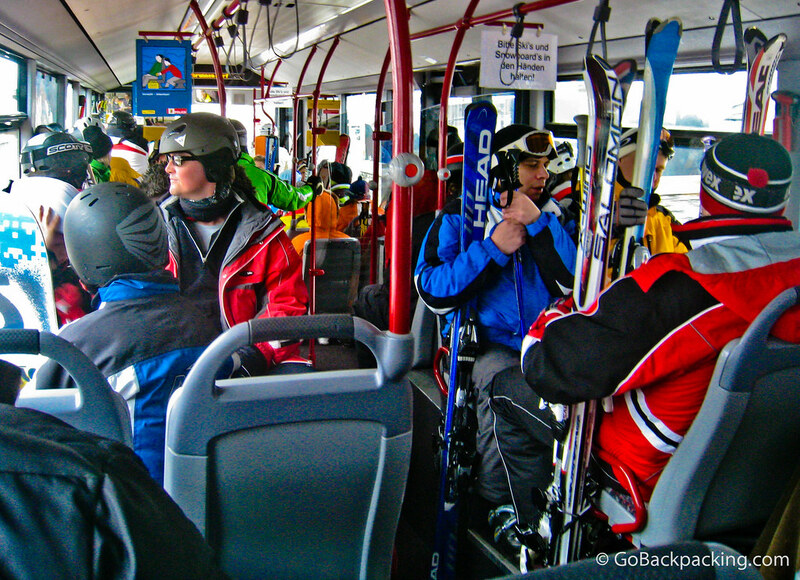 An Interlaken bus loaded with Skiiers and their equipment. The scene reminded me of the old Warren Miller ski videos I use to watch as a kid. At the time, I dreamed of skiing in Switzerland, and the irony of not skiing once I made it as an adult was not lost on me! 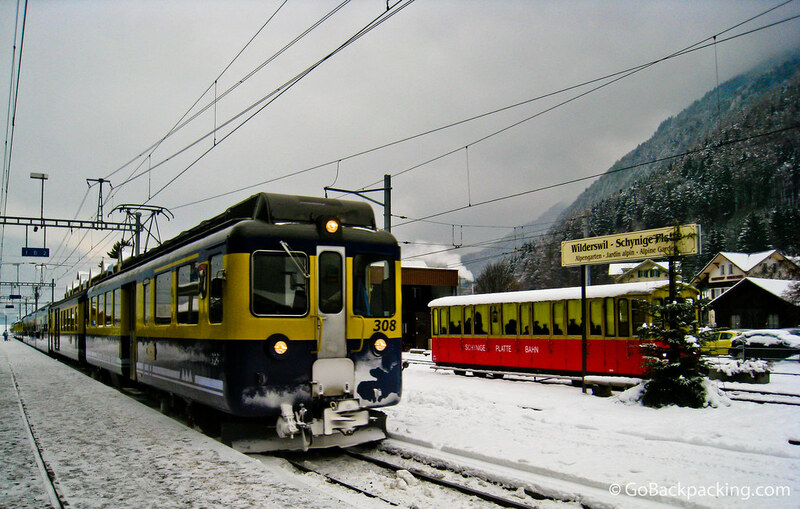 For those without a car, taking the train is one way to reach the tram to Schilthorn. 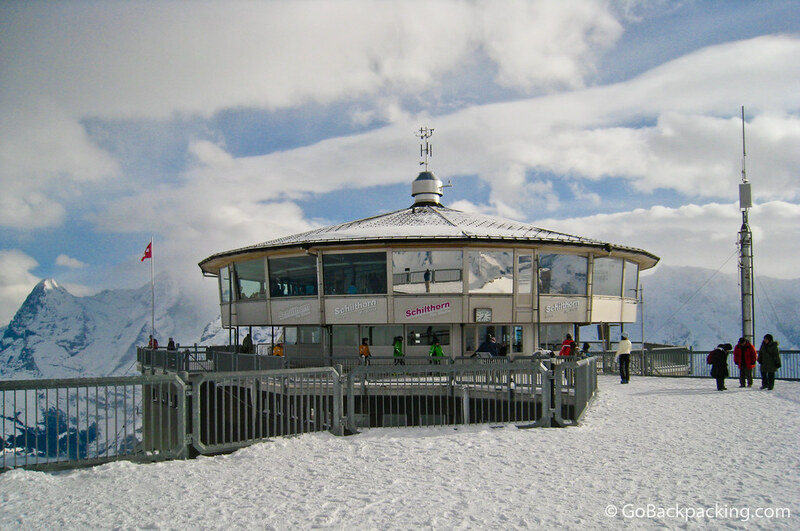 The rotating restaurant built atop Schilthorn (10,000 feet) was the scene of the James Bond movie "His Majesty's Secret Service." 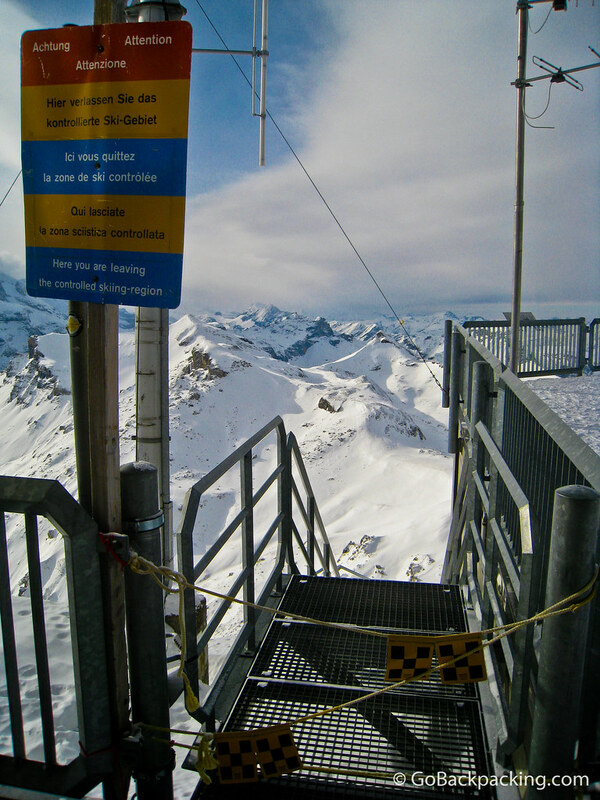 A warning sign greets skiiers and snowboarders considering the off-piste (out of bounds) terrain atop Schilthorn. The mountain peaks of the Swiss Alps extend as far as the eye can see. 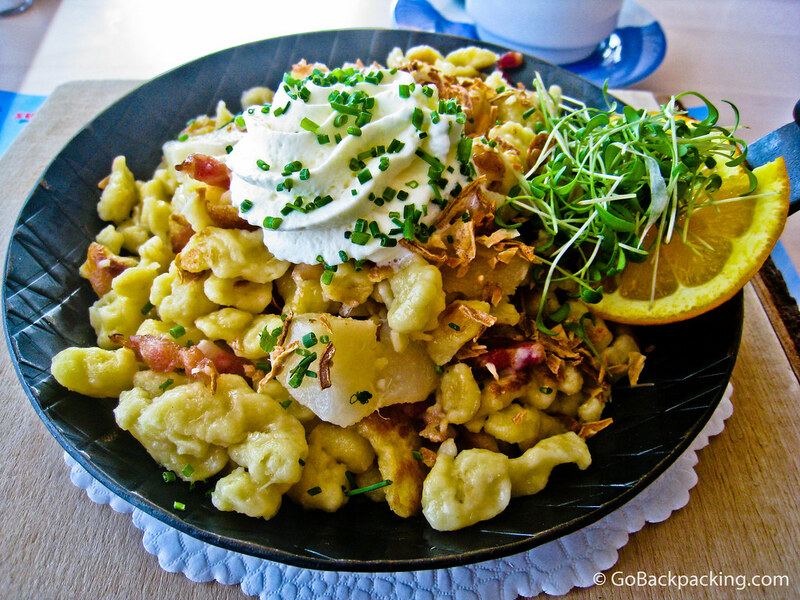 For lunch, I ordered Spatzli Delight: mini dumplings with home made cheese spatzli, bacon, roasted onions, and pear slices. And hot coffee to drink. It was as delicious as it looks! A look back at Schilthorn from the descending tram. It was mid-afternoon, and the sun was already heading toward the western horizon. A ski lift as seen from above on the tram. 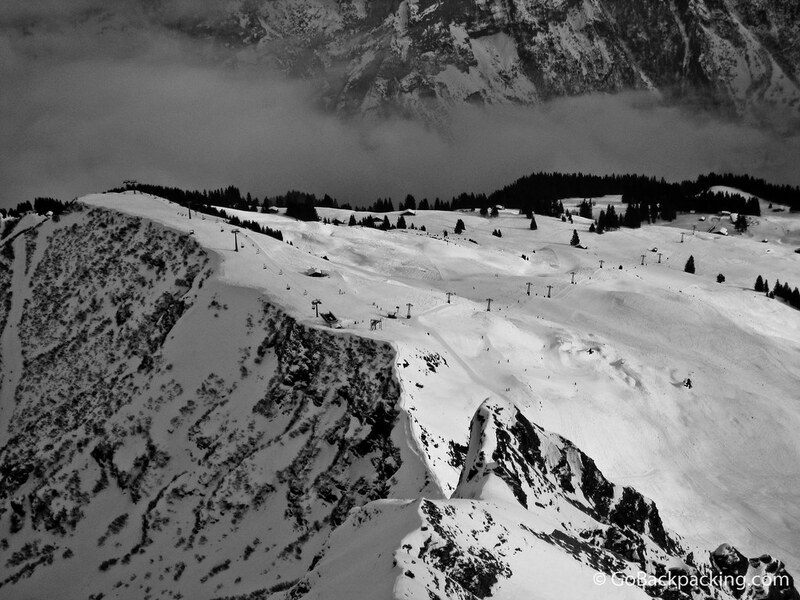 The little people on skiis below helped to give me a sense of scale. 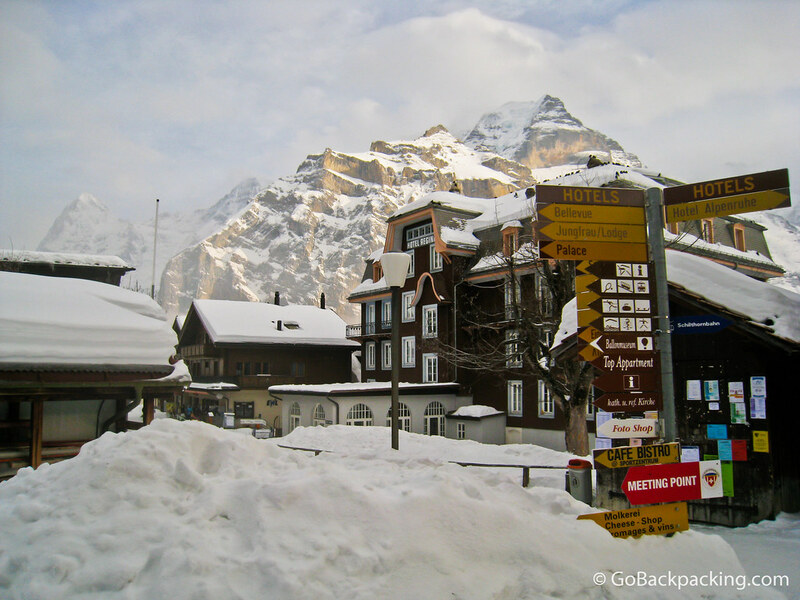 On the way down from Schilthorn, I stopped midway to walk around a small ski village. There wasn't much to see except for a few small shops selling food to the skiiers who rent condos up there. Beautiful pictures, I’m genuinely jealous–I vaguely remember my high school trip to Lake Lucerne, it was stunningly quaint and beautiful, I can’t wait to go back to Switzerland. Did you have any problems breathing at that altitude? Hey Andrew, since I wasn’t doing much in the way of physical exercise, I don’t recall any trouble breathing, but I bet my heart was beating a little faster. And it was really cold up there! Hi Andrew! I hiked from the town below and it took me a very long time to hike up. It took me about 7 hours to hike, which apparently should only take 5. Every few feet I climbed, I had to stop and rest. Definitely didn’t go as fast as I would have liked. Hey Dave! I don’t remember you going through Switzerland during your trip. I actually hiked from Gimmelwald up to the Schilthorn, and barley survived. I am just luck I made it down on the last cable car of the day. I did go during summer, so it wasn’t as bad. However, there was some snow left at the top. It was a decadent lunch, and surprisingly, not any more expensive than a lunch back in Interlaken. Of course lunch in any Swiss restaurant seems to run $20-$25, whether you’re on top of a mountain or not. WOW!!!!!!!!!!! Now that’s a view so special that I could care less what I was eating. That is the perfect lunch! This is going on my bucket list. And because it takes some effort to get there, even by taking the bus/train/tram, the lunch is like a delicious reward! I was talking to a friend yesterday about a ski trip he took to Chile last Summer. He had a great time — said the whole mountain was reserved for the foreigners who travel down there. Wow the Alps are truly amazing! Gorgeous views! Looks so calming. And that lunch, it’s making me hungry! What a perfect day. Your photos look amazing and Skiing in Switzerland is awesome. But often a litte bit expensive for students and backpackers. Beautiful photos! We’ve been to Switzerland and can’t wait to go back, your photos make me want to plan the trip soon!